Get 20% off on all DOMETIC AC & PARTS - Code "20AC"
By buying this product you can collect up to 459 Yachtaid Points. Your cart will total 459 points that will be converted into a voucher towards your next purchase! Must be logged in to collect points. Cruisair’s EBLE low-profile, dual-blower series of ductable evaporators are available in a wide range of capacities and configurations. Available in capacities from 12,000 to 36,000 BTU/hr, EBLE units are designed for installations where there is limited vertical space, such as beneath a seat or bunk or in overhead spaces. 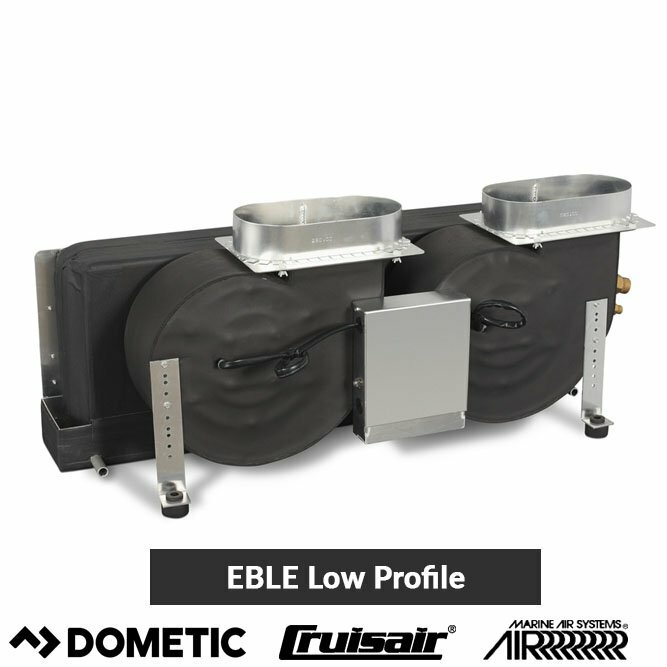 Standard EBLE units consist of a low-profile coil mounted on a deep drain pan with two high-efficiency permanent split capacitor (PSC) blowers drawing air across the coil. The variable-speed blower motors are internal to reduce noise and depth. 115V and 230V, 50/60 Hz models. Condensate drain pan with anti-slosh, antifungal foam lining. Exposed metal surfaces are insulated against secondary condensation. Electric heat available (EBHLE models). Return-air plenum available for overhead installations (EBLEP models). High-efficiency PSC blowers with internal motors for reduced depth. Thermal expansion valve for optimal performance over a range of conditions. Be always up to date with our news!